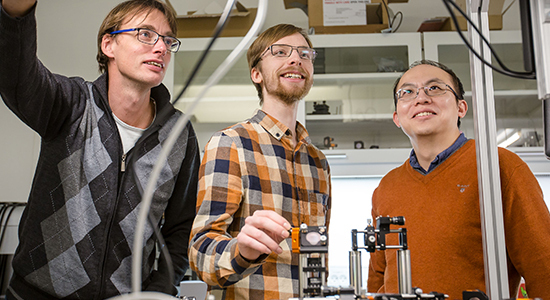 The Theoretical Quantum Optics group investigates how to control and exploit individual quantum systems, such as single atoms and photons. The group has a strong collaboration with the quantum optics laboratory and the quantum photonics group at the Niels Bohr Institute. We also have a long lasting collaboration with the Lukin group at Harvard University. Our research presently focuses on hybrid systems involving nano- and micromechanical oscillators in, or at the verge to, the quantum regime. The group works with experimental setups in the laboratory, where the atoms are trapped in a magnetic field, where they are held by precise beams of laser light and are cooled down to near absolute zero, minus 273 degrees Celsius. The result is an atomic clock that is now so precise that it only loses one second every 300 million years. The Danish Center for Quantum Optics (QUANTOP) started as a DNRF "Center of Excellence" in 2001. QUANTOP’s research is focused on exploring quantum effects at the interface between light and matter. Foredrag med kvantefysiker Anders Søndberg Sørensen, hvor han fortæller om Kvantemekanikkens besynderlige og paradoksale effekter, som forskerne vil bruge til fremtidens kvanteinternet og kvantekryptering. See the list of the theoretical quantum optics staff at the Niels Bohr Institute, University of Copenhagen. Scientific publications by the theoretical quantum optics group at the Niels Bohr Institute, University of Copenhagen.